Educators from Milwaukie High School in Milwaukie, Ore., the 2013 Vision in Action: The ASCD Whole Child Award-winning school. Prominent ASCD authors, experts, and education thought leaders will also present. The lineup includes Thomas Armstrong, Yong Zhao, Eric Jensen, William H. Parrett and Kathleen M. Budge, and Wendy L. Ostroff. There will also be two international pre-conference sessions held on Friday, May 3, 2013. The Australasian section will be held 10:00 a.m.–12:00 p.m. (Sydney, Australia time) with special presentations for audiences in the Australasian region. The European section will be held 2:00–4:00 p.m. (London, England time) with input from key European education experts. "ASCD is pleased to once again offer the Whole Child Virtual Conference to educators worldwide," said ASCD Executive Director and CEO Dr. Gene R. Carter. "Attendees from schools and districts around the world will learn how to create sustainable school cultures that serve the whole child. I encourage educators around the globe to attend this powerful virtual conference." 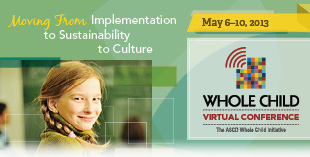 Visit www.ascd.org/wcvirtualconference to register and learn more.